Since the emergence of new media -- social media in particular -- 'traditional' media has had to adapt to and compete in an accelerated news cycle of reporting, commentary and analysis. Media and terror are inextricably linked. The media is expected to report and analyse terror as a matter of international priority. Yet striking the right balance between informing the public without unnecessarily stoking fear or giving disproportionate publicity and attention to a terrorist organisation is a complex task. To make matters even more complicated, since the emergence of new media -- social media in particular -- 'traditional' media has had to adapt to and compete in an accelerated news cycle of reporting, commentary and analysis. Digital platforms such as Twitter and Facebook have changed the flow of information in a way that enables unverified user-generated content (UGC) to appear alongside media outlets' fact-checked content. Unlike traditional media, UGC isn't subject to strict editorial, ethical or practical guidelines -- and the speed and scale at which this information is created and disseminated is hard to contain. This presents challenges to news reporting on terror, such as the spread of misinformation and 'fake news'. While there are many advantages in removing hierarchical barriers to news distribution, there are also drawbacks. Falsehoods, hate speech and conspiracy theories penetrate vast areas of unpoliced online spaces. These narratives have real socio-political and security implications, particularly in creating or promoting community tension and public disorder, which can play out offline as well as online. Research by the UK-based think tank Demos found spikes in the use of 'anti-Islamic' language on Twitter in the immediate aftermath of terrorist attacks. This happened after Charlottesville when Russian propagandists employed hundreds of Twitter bots to peddle far-right extremist content. The dissemination of these provocations increases the risk of 'reciprocal radicalisation', where extremist views on different ends of the spectrum fuel each other's conspiracies and hatred. Opposing ideologies rooted in mutual grievances about the 'other' are reinforced in an escalating cycle. For example, the far-right attack on Muslim worshippers at London's Finsbury Park mosque last year allegedly aimed to avenge the sexual abuse of white girls by Muslim men. On the other side, avenging the suffering of Sunni Muslims at the hands of imperial white Crusaders is often cited as the justification for jihadist extremism. Another example: Britain First's Islamophobic tweets that were shared by Donald Trump reinforced existing grievances of the far right, while simultaneously strengthening growing anxiety among Muslims. Communicating accurate information and minimising the spread of rumours and conspiracy theories is vital to supporting the public during a time of crisis. 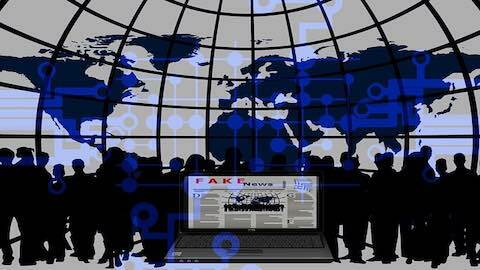 News media outlets and social media platforms should play complementary roles in this process: news media must try to ensure that correct information is disseminated, and social media platforms should be more vigilant in preventing bots and propagandists from flooding online platforms with misinformation. The role of independent, nuanced and responsible journalism has never been more important -- and yet there's a growing distrust of mainstream media's reporting on terror. This stems from Trumpian rhetoric and accusations of fake news, as well as from public perceptions of media bias when reporting on attacks. For example, there's a perception that the 'terrorist' label is reserved for Muslims, while white Caucasian criminals are reported to be suffering from mental health issues or called murderers. The fatal attack on British Labour MP Jo Cox wasn't reported as an act of terrorism, but as a 'murder'. The perpetrator of the Las Vegas shooting in October 2017 that killed at least 58 people was not labelled a terrorist. In contrast, the Westminster Bridge attack in March 2017, perpetrated by an equally disturbed criminal with tenuous links to Islamic State was clearly treated as a 'terrorist' attack and was 'squeezed for every conceivable ounce of sensation and emotion' by the media. Research has highlighted that terror attacks carried out by Muslims (in Western countries) receive more than five times as much media coverage as attacks carried out by non-Muslims, which has further damaged trust in media reporting on terror. Media outlets should remain grounded in facts in the aftermath of an attack, rather than speculating about the perpetrator and their potential terrorist links. A disproportionate response to terror only cultivates further chaos and fear. Violent extremists across the spectrum have capitalised on the spread of misinformation that creates knowledge vacuums and pushes myths and rumours into mainstream society. Media outlets have a responsibility to dispel such myths and rumours, to minimise harm -- both physical and rhetorical -- when reporting on terror. In this age of social media, the spread of misinformation, or 'fake news', has made the job of journalists much harder. There are examples of sincere efforts to maintain journalistic integrity, but there are many challenges to overcome, especially related to UGC on social media. So what is the solution? Calling for greater government control or a 'content watchdog' to police online platforms isn't necessarily the right approach. It echoes precisely the 'Orwellian' sentiments that Silicon Valley tech companies are pushing back against. Rather, as a first step, it should be in their own interest for online platforms to work with news media outlets to develop appropriate ethical, editorial and practical guidelines, and then to regularly adapt and revise those guidelines. Sofia Patel is an analyst at ASPI. Image courtesy of Pixabay user pixel2013. World News: "Media and Terror in the Age of Social Media "